Wow, so I went out to this unbearably hot event at Del Valley stadium to get Cedric Griffin and Aaron Ross in the middle of July. That’s dedication. Anyway, it was a really good and encouraging camp for the kids. There were some great speeches from the players, and they were more than happy to provide autographs to anyone and everyone. I patiently waited until the end. A kid kept backing up nervously, so I told him to go ahead and get Cedric’s autograph before me. Cedric and the kid looked at me and laughed. It was his son. Cedric told me that he loved every moment of the NFL experience and cheerfully penned these 3 cards for me in no time flat. 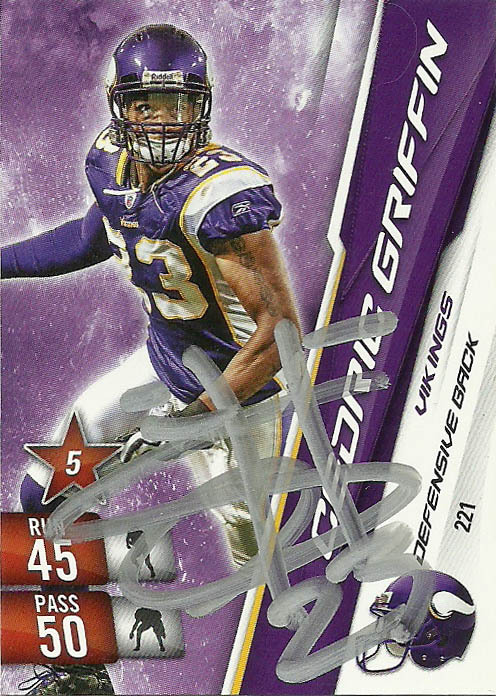 I previously had gotten Griffin on a card or two a few years ago. 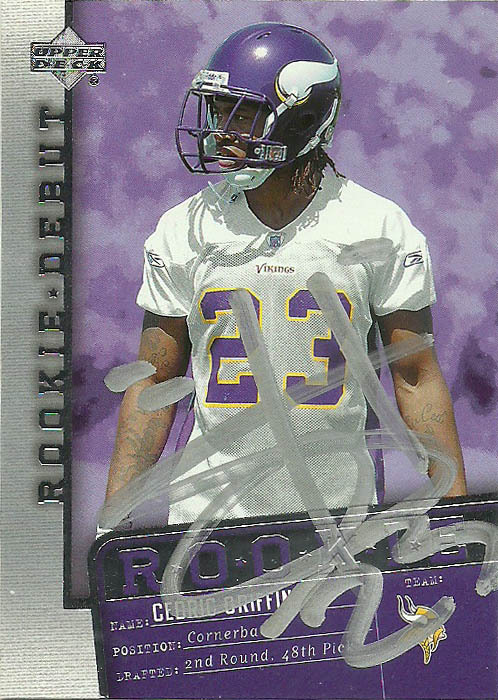 I gave away the Adrenalyn card -even though I really liked it, so I had always wanted to get Cedric again on a few more cards including the Upper Deck 2006 rookie debut- which I seem to have carved out a small niche in collecting. I don’t like that particular card. It appears that somebody Photoshopped the background very poorly. The Score Select 2008 is an okay card, but the chrome is a bit garish. 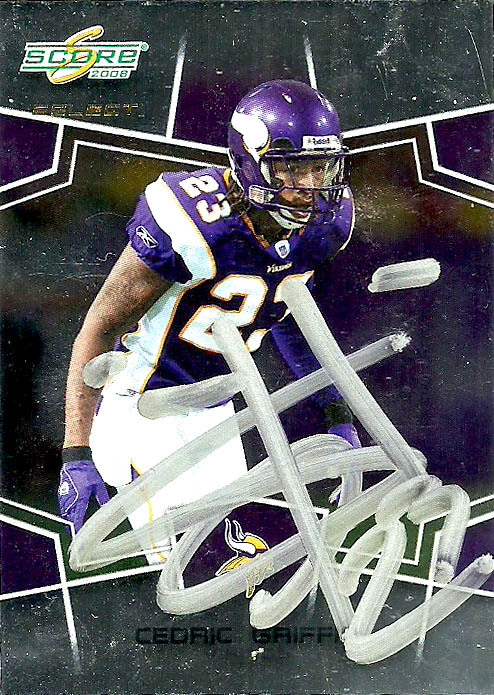 Thankfully, Cedric’s bold silver autograph makes up for the design descrepancies on each card. 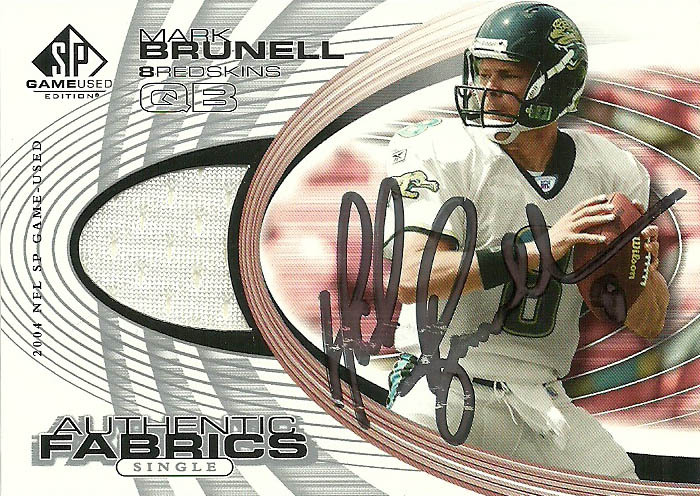 Mark Brunell was one of these ageless wonders. He put in 19 seasons under his belt of solid to workmanlike/ journeyman quality work. In the annals of pro football, he doesn’t get the respect he deserves, but his arrival in Jacksonville heralded an era of respectability in Jaguars football. The owner of all of the passing records in the franchise’s record books when he departed the Jaguars after the 2003 season, Mark earned 3 Pro Bowl nominations, including MVP honors of the 2000 Pro Bowl. Originally a 5th round pick out of Washington State by the Green Bay Packers in the 1993 draft, Brunell didn’t see much action playing for the Pack, sitting behind Brett Favre and Ty Detmer. He’d be eventually traded to the Jaguars in 1995 for a 3rd and 5th round pick before the team’s inaugural season began. 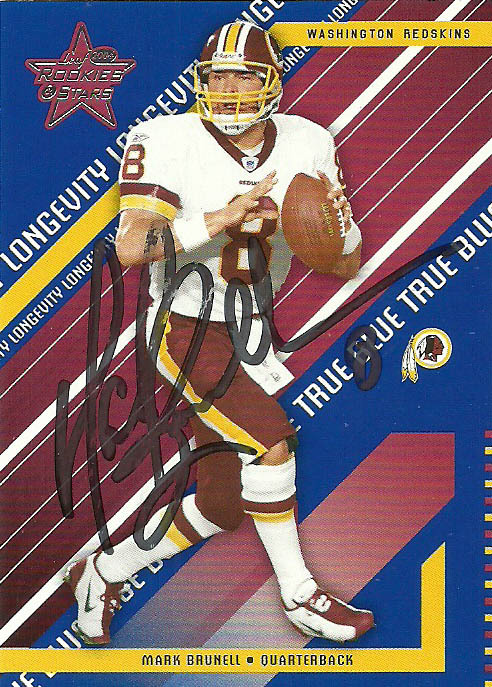 After his banner time in Jacksonville, Mark was traded to the Redskins and provided stability to the quarterback position in Washington from 2004 to 2007. During that period he’d break the NFL record for most consecutive completions in a game with 22. In 2008, he signed with the Saints- winning his lone Super Bowl Championship (XLIV) as Drew Brees’ backup. Brunell played 2 more seasons for the New York Jets (2010-2012), before retiring. Since that time Mark has gone into coaching starting at the High School level, and as of 2019 is coaching in the Jacksonville area. Mark has made the news otherwise for all the wrong reasons financially, and at one point needed to file for bankruptcy. Those are always the most humbling moments- so it was not a big deal to send him the requested donation. 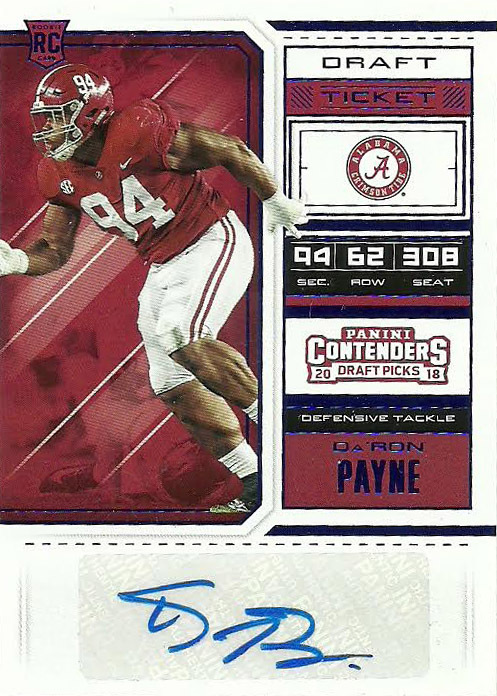 Da’Ron (or Daron) Payne is considered a rare behemoth, with not only space-eating power but the strength to go along with it. He weighs in at 6’3″, 311, and bench presses easily over 450 pounds. Da’Ron also commands the line and teams had a hard time running on him- even when using a double team. With other great talent on the line at Alabama, it took sometime for Payne to break into the starting lineup. In 2017 he finished with 53 total tackles, 1 tackle for loss, 1 sack, 1 interception, 3 pass deflections, and a fumble recovery. He flew up the draft boards with his solid combine results. This allowed Da’Ron to be selected 13th by the Washington Redskins. Turning heads in mini-camp, Daron will slide into the Redskins alignment at defensive tackle and may even play a bit of nose. A nagging ankle injury during camp though limited his reps and he didn’t really play much during the preseason. Daron had an impressive debut in the NFL. Shifting from defensive tackle to nose depending on the alignment, Payne started all 16 games for Washington, and posted 56 combined tackles, 6 tackles for loss, 5 sacks, 3 pass deflections and a forced fumble.